Andrew was born in Taranaki, New Zealand and studied Chemical Engineering at the University of Canterbury in NZ. Following graduation, he worked for three years at an NZ food processing company, gaining industrial experience of chemical engineering. Between 1986 and 1990, Professor Livingston completed a PhD in Chemical Engineering at Trinity College, University of Cambridge. After finishing his PhD in 1990, he joined the Department of Chemical Engineering at Imperial College. In 1994 he graduated with an MSc in Economics from the London School of Economics, following part-time study. Professor Livingston was made full Professor at Imperial College in 1999, has published over 300 refereed papers, and has filed 33 patent applications. He leads a research group of 20 MEng, MSc, PhD students and Post-Docs, with current research interests in membranes for molecular separations, and applications of membrane separation to new molecular manufacturing platforms. In 1996, Professor Livingston founded Membrane Extraction Technology, a spin-out company which evolved into a profitable business manufacturing solvent stable Organic Solvent Nanofiltration (OSN) membranes. In 2010 MET was acquired by Evonik Industries of Essen, Germany, and continues in business as Evonik MET Ltd., a part of the Evonik Fibres and Membranes Business. From 2008-2016 Professor Livingston served as the Head of Department in Chemical Engineering. He is Imperial’s member of the BP-International Centre for Advanced Materials (BP-ICAM) Programme Management Board, a $100M 10 year programme of research into materials for the oil and gas industry. In 2015 with Mark Buswell at GSK he led a team which founded the GSK Engineered Medicines Laboratory (EML), a multidisciplinary, cross faculty collaboration, guided by pharmaceutical industry scientists, pursuing the design and manufacture of new types of medicines based on engineering principles. He is the inaugural Director of the Barrer Centre, established by Imperial academics in Chemical Engineering, Materials and Chemistry Departments in 2016 to carry out research into breakthrough materials for separation science and engineering. The Livingston Group enjoy outreach and public engagement, regularly contributing to the Imperial Festival and Imperial Fringe. Professor Livingston also enjoys giving lectures to non-specialist audiences on his research, and entrepreneurial experiences. In 2017, Professor Livingston was appointed as the Interim Academic Lead for the Rosalind Franklin Institute. 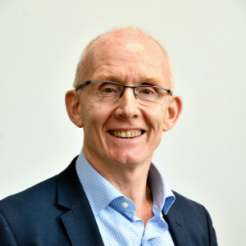 He will act as Interim Director from November 2019 to June 2019, when Professor James Naismith takes up the post.